Makeup Geek offers such a large variety of eyeshadows, that it can be a little overwhelming if you're just getting started with the brand. The comments on my last Makeup Geek post echoed those thoughts, so I decided to put together My Makeup Geek Starter Kit. I think the easiest way for me to do this would be to separate them into finishes. Makeup Geek has three main finishes; matte, shimmer and foiled. They also have loose glitters and duo chrome shadows, but I've not tried them. The regular eyeshadows are £6 and the foiled eyeshadows are £9.25 per pan. Although the prices have increased slightly since I first purchased them, I wouldn't hesitate getting more because across the board, the formula is excellent. The shadows are smooth and pigmented, even the mattes. The foiled shadows have an intense liquid metal effect that's truly stunning and looks almost dewy on the lids. I house all of mine in Z Palettes which I highly recommend. They come in various sizes and styles. The palettes are sturdy, easy to clean and you can see inside the palette without opening it. 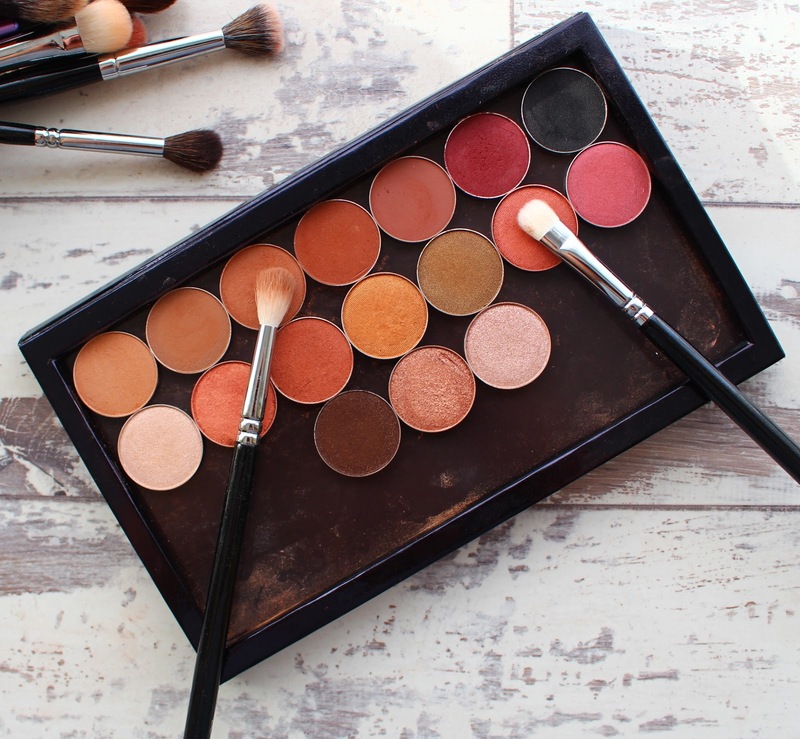 You can find both Makeup Geek and Z Palette on Beauty Bay. Purely Naked- A slightly shimmery sand shade that makes a great base. I've included this in the matte category as the shimmer is barely visible and on me at least, it's basically matte. Either way, it's a great all over shade to use from lash line to brow as a base for other shadows. Latte- A cool toned brown that can be used as a transition shade or to shape the crease. You could probably use it as a brow or contour powder depending on your skin tone. Frappe- A very warm mid toned brown that I use all the time in the crease. It pairs well with pretty much all of my favourite shades and is the easiest way to warm up a look. Cocoa Bear- A warm dark brown perfect for the outer corners. I always use this to smoke out a look as it's really effortless. You can build the intensity to suit you and it's subtle enough for everyday. Wild West- A unique pink toned brown that I love for the crease. It's a great way of adding a little colour into your routine, whilst still remaining in the neutral realm. I've not come across another shade like it. It's showing up quite dark on camera, whereas in real life it's lighter and you can easily adjust the intensity to suit your taste. Bitten- A dark purple with hints of red. It definitely leans more purple on me, which I love. It's still neutral and my favourite way of applying it is very lightly through the crease. I typically use a small brush for precision and really bend it out to achieve a subtle gradient of colour. Corrupt- A classic matte black that you can't go wrong with. It's a staple shade that should be in every makeup collection. Corrupt is wonderfully dark and a true jet black. Shimma Shimma- A white based gold that is perfect for for highlighting the inner corners of the eyes. It's very brightening and really opens up the eyes. You could even use it as a face highlighter. Cosmopolitan- A peachy rose gold that is honestly one of my favourite eyeshadows of all time. It's very warm and shimmery, without being in your face glittery. It pairs really well with Frappe and Bitten. That trio of eyeshadows is my go to eyeshadow look all year round. Goddess- A warm copper brown that's neutral enough for everyday, but is still quite special. It's the perfect everyday Autumn shade that would suit everyone. Glamorous- A bronzy gold that, like Goddess, is very appropriate for everyday. It works well all over the lid with either Latte or Frappe blended into the crease. It's an effortless eyeshadow to wear. Pretentious- A warm gold with brown and olive undertones. It doesn't look like much in the pan, but when applied to the eyes, it comes to life. It's such a pretty neutral that I couldn't not include it. Roulette- A rosy toned copper that looks great either all over the lid, or blended into the outer corners. It's very different to any other shade I own and would suit so many skin tones. Another great way of adding colour to your look, whilst remaining neutral. Anarchy- A pinky berry that screams Autumn. It's got a nice smooth shimmer to it that really catches the light. Bada Bing- A dark brown with flecks of gold. It's a very universal shade and perfect for really smoking out a look. The flecks of gold make it something special. Grandstand- A taupe rose gold that is just so pigmented and beautiful. It looks stunning all over the lid. Although it's very intense, I would definitely wear it during the day. It's too pretty not to! Starry Eyed- A pale pinky champagne gold that works well for highlighting the inner corners, or simply applied all over the lid. It's very brightening and very pretty. 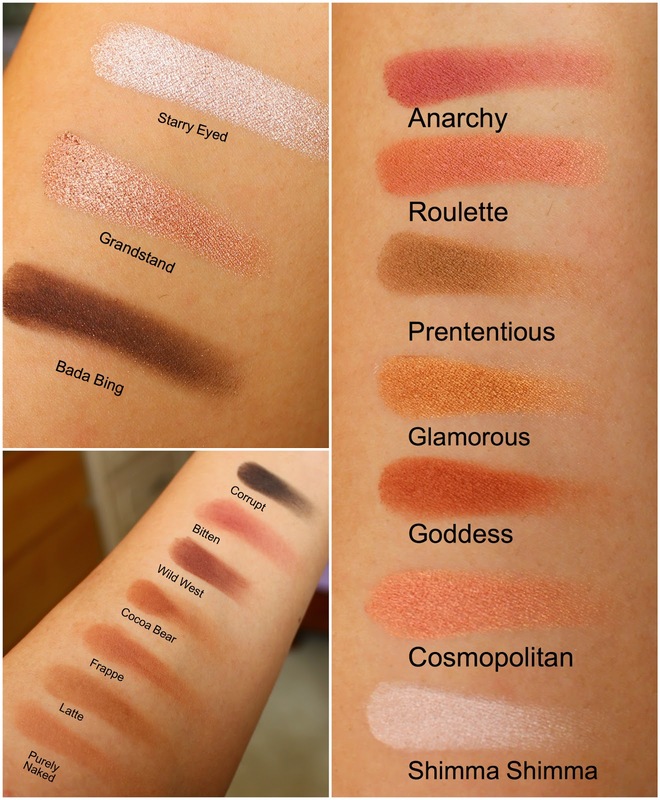 Makeup Geek is the ultimate eyeshadow brand in my opinion. They offer high quality eyeshadows with the heavy price tag. What's not to like? With the festive season in full swing, a little palette made especially for a loved one would be such a thoughtful gift. You could build a small Z Palette with some of the shades mentioned above and write suggestions of others you think they might like. If I got that under the tree, I'd be over the moon! What Makeup Geek eyeshadows do you recommend? I own alot of these shades, I filled my large Z Palette. Purely Naked is my most used shade as a transition shade. I also love Grandstand, Cosmopolitan, Jester, Brownie Points, Bitten and Beaches & Cream. I just googled Jester and I want it now haha! Purely Naked is an excellent transition shade. I love makeup geek shadows, especially the foiled ones! I have the ones listed on here and they are definitely favourites of mine. I have been wanting to buy makeup geek eye shadows forever. This post has made me want to go out and get them. All the shades are absolutely beautiful. Most of the ones you mentioned in this post are ones that I have had my eye on. They are definitely great for a starter kit! I think they're such staple shades that would suit everyone. 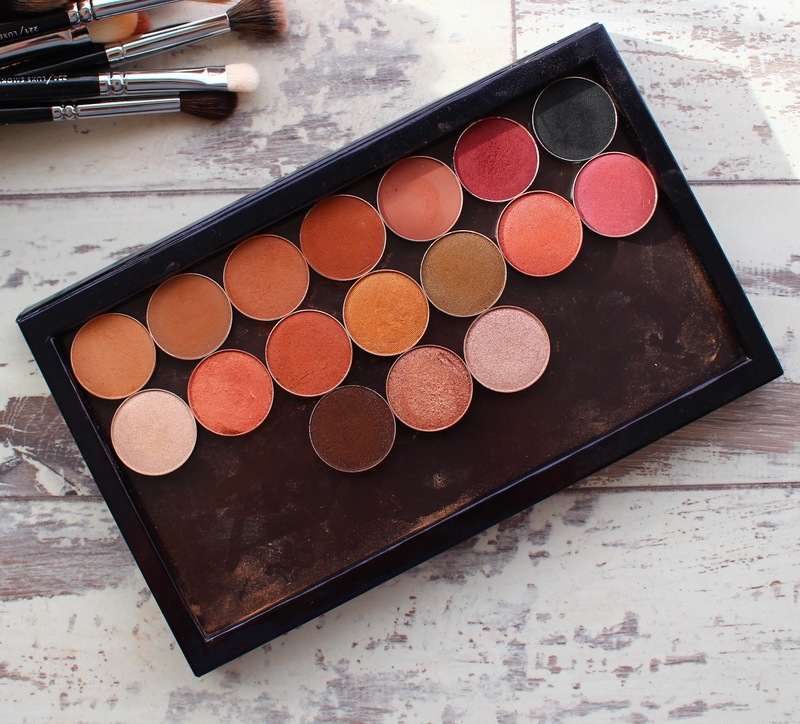 You can't go wrong with Makeup Geek! Grand stand looks so perfect I'm gonna get that now!! All the shades you have look right up my street. I've always wanted to try MUG eyeshadows, especially their foiled shadows. Thanks for mentioning these shades, they'll come in handy once I bit the bullet and try them. Ahh these all look so good! Such lovely shades! I really need to get some of these eyeshadows in my life! Yes you do! They're amazing! Frappe, Cocoa Bear and Wild West would all me in my starter kit :) I'm a huge fan of Grandstand and Bada Bing too - great choices!